I was digging through files the other day and came across this photo from several years ago, so I decided to spend a few minutes processing the image instead of doing what I was supposed to be doing (right now, I'm writing this, instead of doing what I'm supposed to be doing). 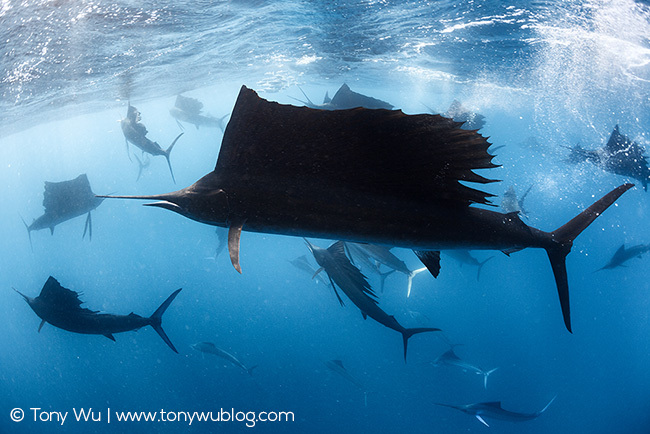 Depicted is a swarm of Info-Pacific sailfish (Istiophorus platypterus) engaged in a feeding frenzy, basically obliterating a school of sardines (remnants of the school just barely visible top center). The experience was intense. Neither the seas nor the fish were calm or cooperative. It was pretty much chaos incarnate. The photo is from 2010, during a short trip I took with friends Eric Cheng and Sterling Zumbrunn. Seems like a lifetime ago. Right...now back to finding something else to do besides what I'm supposed to be doing.